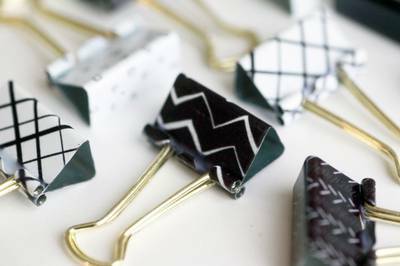 Enter your email address below to receive a notification when V. Paperie starts accepting new sign-ups! 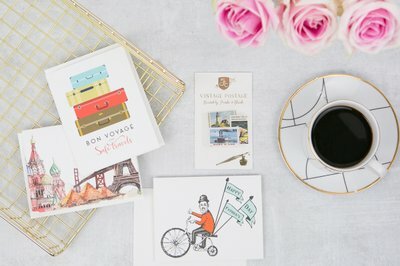 Enter your email address below to receive a notification when V. Paperie is accepting new sign-ups again. 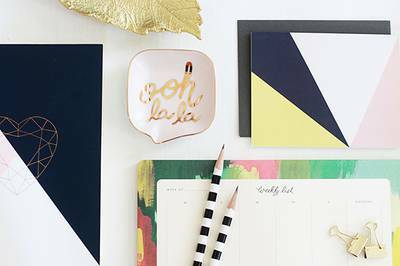 We are graphic designers who have a passion for beautiful design, handlettering, pretty paper, and stationery. 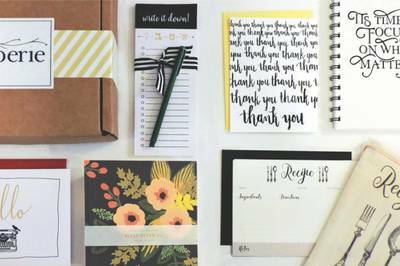 Our box contains 3 greeting cards, paper goods item (notebooks, journals, notepads) and an office accessory or gift. 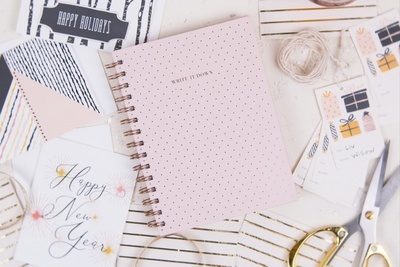 Released monthly, each box is designed around a theme, season, or specific creative project. $4.50/month for shipping. Notebooks, Journals, and Notepads, Oh My! Oh gracious, this was a lovely box. 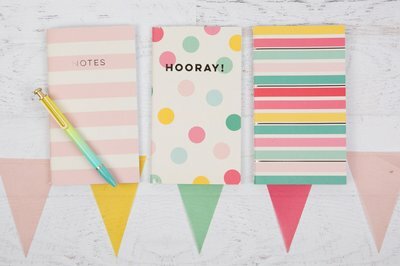 I adored the bunny notepad and the darling cards! So adorable! I will be posting a video on my Instagram, Facebook and YouTube channel in the next day or so! Beautiful box this month. Great variety and high-quality products. Very pleased with my first box! I decided to give this box a try since I enjoy paper crafts and calligraphy. 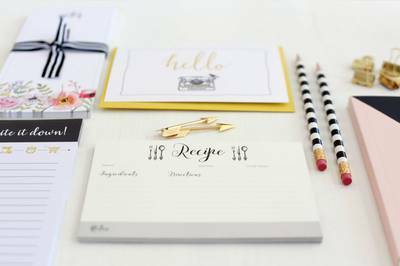 I was pleased with the assortment of an adorable grocery list pad, cards, place card holders and a pen. 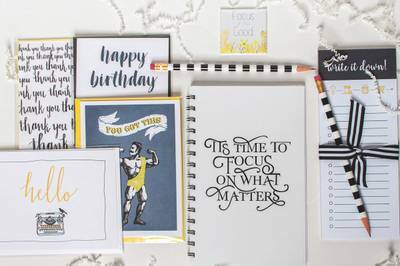 It’s great variety of paper products to keep my stash or occasion cards and cute stationery products stocked up. I love everything in my October box of goodies! The pouch and candle are just awesome, and the cards are great! Love the,seasonal color. Thank you V. Paperie! 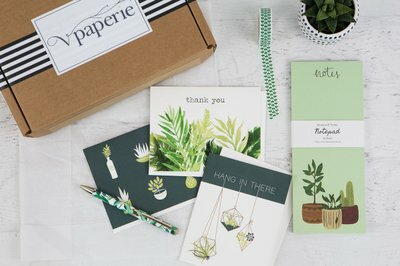 I received my first V. Paperie box today. The items are useful and beautiful, fit the theme perfectly! Loved the presentation, too. I deducted one star because the $7.50 shipping fee slipped by me and makes the total cost a bit too high for what’s included. The actual shipping box needs to be upgraded, as well: mine arrived looking as though it had been sat upon. All of the goodies are so fantastic! box of surprises...especially at the beginning of each month! 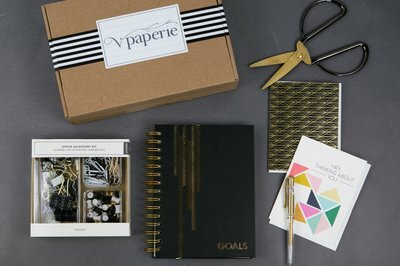 V. Paperie is truly one of the best subscription boxes out there! I have subscribed to at least 20 different ones and this one is by far one of my favorites! The uniqueness and quality of the products makes me excited for each new box to arrive. 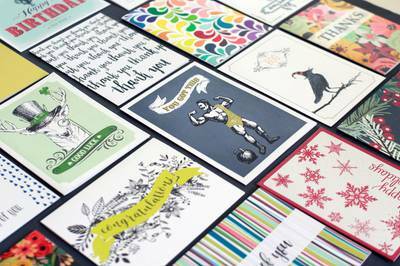 If you can only afford one box, make it V. Paperie! This month's box was excellent! I deducted a point only because at $32.50, I feel it's overpriced by four or five dollars. That being said, the choices and the quality of the items is outstanding. 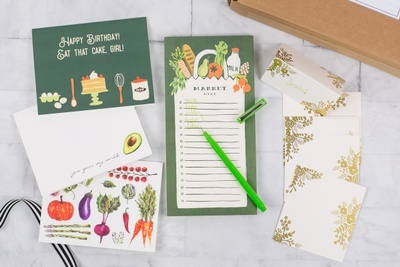 I love this subscription box. The cards are unique and I enjoy the overall presentation. I can't wait for next month! This is the perfect box subscription! I have also given as a gift and it was perfect and easy!! They send reminder emails before you renew each month so you can opt to put on hold for a month or two and then continue in the future. I have loved all the items each month! Thanks V.Paperie!